Connectomics as a field has focused on the brain and retina, but it is important to note that the nervous system also consists of nerves and cell bodies in the spinal cord and throughout the body. In order to best understand how neurons wire together, students must understand the basic brain structure, the structure of a neuron, and how it functions. For any questions, please post a new discussion to EyeWire’s Education Forum and for further material please see EyeWire Edu Recommended Teacher Resources. Cerebellum- The heavily ridged structure in the bottom back of the brain that controls balance and motor control. Spinal Cord: Sensory and motor information organization from the body to the brain. Peripheral Nervous System: Everything else. Sensory neurons, motor neurons, neurons in your internal organs. 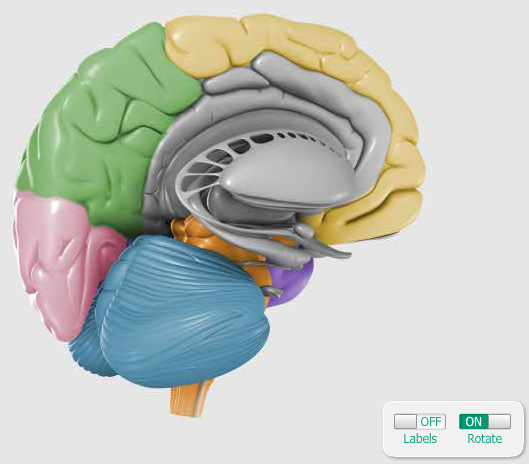 Activity: Let students play around with the FINR brain structure visualizer. The structures students will explore are connected to each other through large tracts of cell branches. These connections allow for communication and collaboration between the structures. Ask students to write down which parts of the brain they think may be connected, and what they think the brain can do because of each connection. FINR hosts a 3D rotating brain and offers a few paragraphs about the function of a structure when you click on it. It also offers explanations of common brain injuries, highlighting the affected region. FINR Takeaway Concept: The brain is made of many structures that are defined by their function. These structures must communicate with each other. 2. Video: To lead from brain structure into the next lesson, watch this BrainCraft Video(3m21s) about localization of function and development. What are the three main steps in early neural development? Answer: newly formed neurons develop, neurons migrate to location, neurons begin to develop connections between each other. The tracts that connect the structures in the brain are made up of fibers from many cells(amount variable between tracts, the largest is the corpus callosum at 200 million cells). These fibers are only part of a brain cell. A brain cell is better known as a neuron. A neuron has a large blob-like structure from which its branches emerge called a cell body. This is alternatively named the soma. The nucleus is here, so this is where the DNA is housed and this is also where most of the organelles are found, such as protein preparing golgi apparatuses and energy producing mitochondria. Mitochondria are also found down the length of neuron branches. This is a good time to bring your lesson back to biology. The cell body has many long projections, and one of these projections is called the axons. Axons are usually longer because they are signal senders, and must travel to the cell they are sending a signal to. Axons are also sometimes physically distinguishable by the insulating sheaths (called myelin sheaths) that cover them to speed up electrical signal transmission. The cell body has many short branching projections, called dendrites, which are signal receivers. The point where a communication signal is transmitted from one cell to the next is called a synapse. The synapses are the connections and are thus the basis of connectomics and the brain working as a unit. The majority of synapses send the signal from one cell’s axon to another cell’s dendrite. Scientists used to think that projections stopped growing when an individual reached adulthood but discoveries are rapidly being made about adulthood neural plasticity. Neural plasticity is the ability to form new projections and connections in response to damage and shifting environments. When you create an account you are introduced to the game with a tutorial. Additional support is available if you don’t feel confident teaching the game after the in-game tutorial. Use this EyeWire Worksheet to allow student to navigate the game while learning about neuron structure, edit if you have any specifications for usernames/emails you wish students to use. Neurons communicate at synapses as mentioned above. When enough ions flow through the neuronal membrane the neuron will send an electric signal, called an action potential, down the length of its dendrites. The change in ion flow works like a light switch without a dimmer; there is a “threshold” if you will. If just one too few ions that cross the membrane, there is no action potential. If more than enough ions cross the membrane, the action potential is there, but no stronger than usual. When the action potential gets to a synapse, the neuron will communicate. Neurotransmitters, or signal chemicals, are released into the tiny space in between the neurons where they almost touch. The sending and receiving neurons in a synapse will never switch jobs. These neurotransmitters will bind with receptors, which in turn will tell the signal receiving cell to do something, such as send an action potential itself. Look, one at a time, at each neuron. What is required to make it fire, and how is it’s own firing pattern unique? Try organizing the neurons so the muscle twitches faster or slower. You can add neurons to make this work. Neural structures and connections reflect of the real world around us. Pick a stimulus in the environment and design a neural circuit that could theoretically process this stimulus by breaking it up into parts. You can do this first by leading the class in an example, and then you can have students do this in small groups. Pick a simple stimulus. This can be based on memory, one of the five basic senses, emotion, associations, movement or something you think of yourself. Try to divide this stimulus into the smallest parts you can think of. Colors are part of light spectrums, objects are made up of parts, motion is combines spatial change and progression of time, and emotion is a result of associations and memory. Think about how neurons compare, contrast, order, and rank the little parts of the world to make sense of it. They look for patterns. Give students the stimuli, and allow them to do steps 2-4. Stimuli Ideas: Seeing shapes, seeing faces, touching something bumpy, sadness, happiness, remembering a name when you see a face, catching a ball when you see/realize it’s flying at you, a sight-impaired person reading braille. Another example: Grazing your fingers across something bumpy results in sensation appearing and disappearing quickly as the raised parts of the surface brush against the skin. It also involves feeling your fingers jump a little in space every time they hit a raised part of the surface. Sensation neurons will fire with brief time delays as they touch nothing. The neurons that feel where you are in space will fire in reaction to your fingers jumping. If you would like to become more comfortable with neuroscience information, view pages such as BrainFacts and Neuroscience for Kids: Explore. Students frequently ask questions about concussions, and frequently ask questions that are way out there. Remind students there is still much about neuroscience that that is undiscovered, but that they could help study in the future. The students should leave with more questions and curiosity than they came in with. Again, for any questions, please post a new discussion to EyeWire’s Education Forum and for further material please see EyeWire Edu Recommended Teacher Resources. This lesson plan was made adhering to the Next Generation Science Standards on Structure and Function for High Schoolers, though it is approachable for middle school students. 2 Responses to "Connectomics Lesson Plan: EyeWire Edu"